I remember when I first moved to Canada, landing in Vancouver, and having to go down to Seattle for a meeting, and taking an interurban bus and thinking to myself “dear God, how does the first world define good interurban travel? This is horrendous!”. I hardly recovered from that, until recently when the Pacific Coach Lines started to equip their interurban buses with wireless internet connections. But the best, luxurious travel I had ever experienced (short of travelling first class by airplane) has been with Enlaces Terrestres Nacionales in Mexico, recently fused with Turistar Futura and becoming ETN-Turistar Lujo. 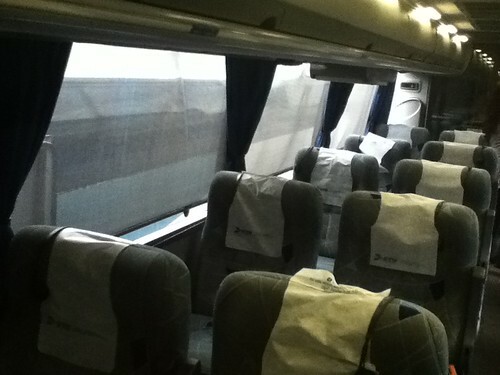 Enlaces Terrestres Nacionales is actually a company that was founded in Leon, Guanajuato, and the idea for it was that most other interurban travel was almost like second-class travel, so first-class travellers needed first-rate service. ETN started the practice (now widely adopted) of providing a lunch/snack and a drink (though I’m really sad to see that the level of service is going downhill because now, for short distances’ travel (2 hours), ETN does not offer a sandwich, but lately they’ve been offering only peanuts and other small snacks (this is very recent, perhaps 1 week or so). 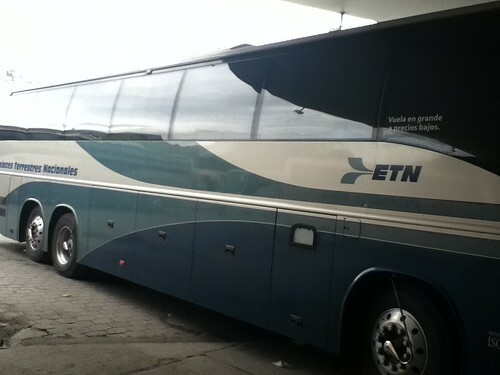 I travel ETN everywhere when I’m in Mexico, simply because I like the level of comfort and service. Most ETN units are equipped with wireless internet now, though it drops the signal every so often, particularly when travelling through mountains. Overall, I can’t complain. The worse ETN-Turistar Lujo still beats any of the Canadian interurban buses I know of (except for Pacific Commuter Club). I think I will forward my post to ETN-Turistar Lujo folks, though. I really don’t like the downhill. “yes, we had a full-on snack bag, and now we give you peanuts” trend. 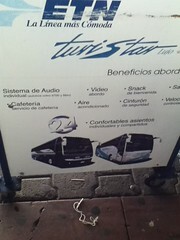 Disclosure: I pay for every single one of my trips on ETN-Turistar Lujo, on my own dime. As always, I retain full editorial control over anything I post on my site. I have no financial nor otherwise stake in ETN.